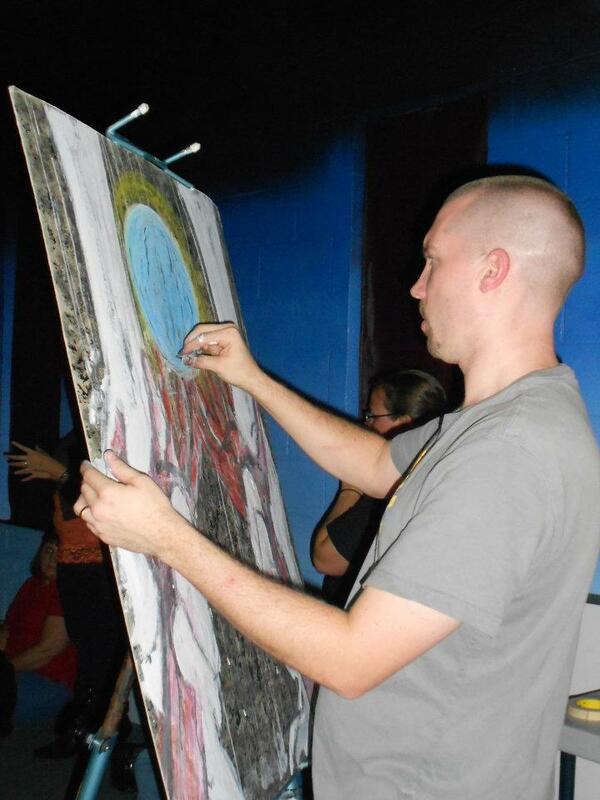 Sunday night I received opportunity to début Plasso Design as a visual arts ministry during Epicenter student worship. Redeemed, an extremely talented group of students in the ministry, lead Epicenter worship through music and drama. 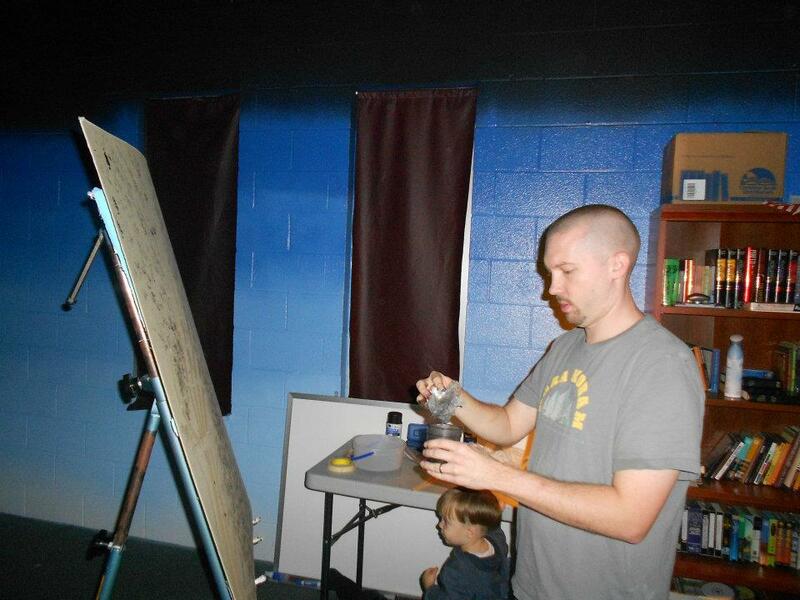 For this service, the group organized a night of prayer and praise. Redeemed led the entire the service with songs they hand-picked to inspire an worshipful environment and encourage each one attending to personally connect with God during that time. We turned the lights down low, leaving a few lamps burning dimly, and began communicating with our creator. 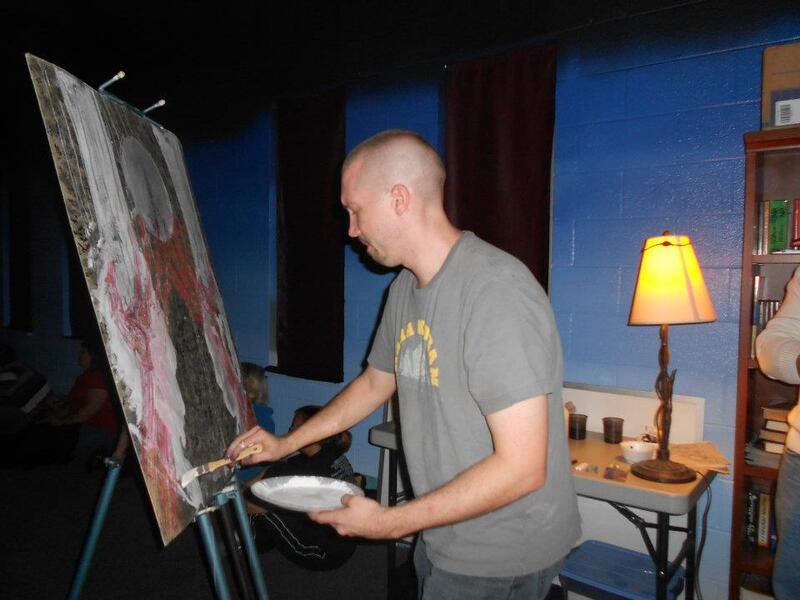 While Redeemed led us to communion with God, I set up in the back of the room, interpreting the worship experience on a 30″ x 40″ masonite board. In considering the mechanics of worship, I immediately envisioned two open hands, raised as if offering all they contain. To begin the piece, I created the bone structure of these two hands using masking tape. Next, I prepared two ink washes, light and medium hues. Using crumpled paper towels, I patted a crackled texture on the full face of the board. This random, shattered background represents our own brokenness. No matter how good we make ourselves appear, nothing hides our actual damaged state. Using straight India Ink, I finished the background texture by crumpling up an old bulletin insert I found on the bookshelf, wadding it up and using it to apply the black ink. Using various hues of red oil pastels, I drew flesh on the arms formed by the masking tape, finishing the flesh tones with orange and yellow. I wanted these structures to reflect humanness, guiding my color selection. Once I had the first layer of the human arms complete, I began forming a second set of arms extending from the top of the board and gently supporting the fleshy arms below. This second set of hands represent those of Christ, clearly defined by the oblong scars in the wrists. 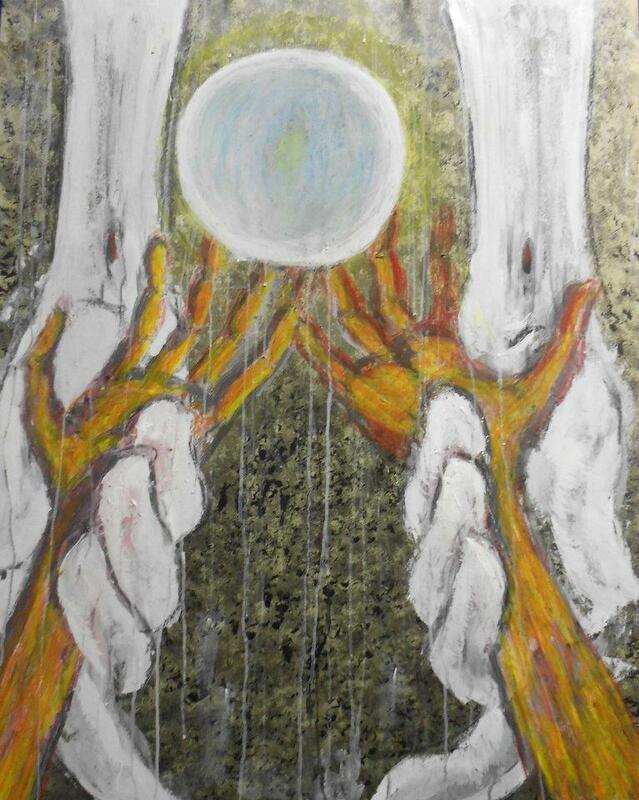 Last, I created the crystal-like orb using white Gesso and oil pastels. The sphere is symbolic of our offering to God. Our talents, our requests, our concerns, and our praises are all included inside this precious gift. The the offering being presented in the image appears released by the hands presenting it, waiting for God to grasp it in joyful acceptance. That is not what occurs, however. The hands of Christ reach past the gift we create for Him, almost oblivious to the fact it exists, to grasp the hands presenting it instead. To convey this is intentional, the hands of Christ are out of proportion with the arms. Bordering on cartoon-like, the small arms, combined with using vertical lines in the creation process, give off a feeling of stretching, as if the hands are heavy. This creates a sense of Christ’s hands pulling up on the human hands, bringing them up to Himself. This is the embodiment of worship; we offer whatever we have to God. In return, He bypasses our offering, reaching to embrace us instead. God is not interested in what you have to offer, He wants you. Wow this is really striking idea. I love the message you put in that picture and I think the way you painted it is very interesting. Gave me alot to think about, congrats!